Choosing between putting a meal on the table or paying an electric bill is one far too many Americans have to make. They’re often referred to as the “working poor” — a term bandied about when talking about socioeconomic classes, voter turnout, and political party targets. 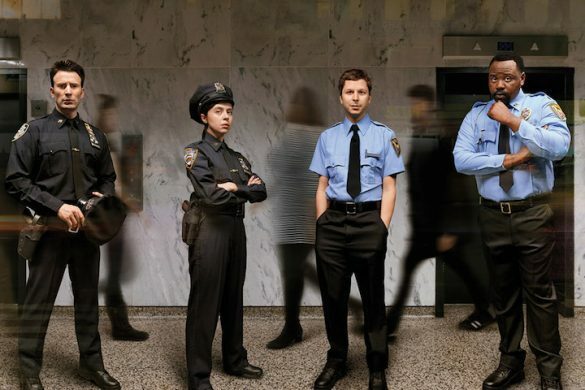 But as Emily Schwend’s new play Utility exemplifies, the unsettling words take on new meaning when they’re connecting to lives rather than statistics. Amber (Brynne Barnard) can barely hold her family together while working two jobs, managing her semi-unemployed, man-child of a husband Chris (Patrick TJ Kelly), paying the bills, making lunches for her three kids, keeping gas in the car and the lights on. Forget finding time to eat and sleep. Amber’s life is an unrelenting grind. There is no light at the end of the tunnel or positive change coming. She embodies the working poor, barely making ends meet with little chance of getting ahead or making her children’s lives significantly better than her own. 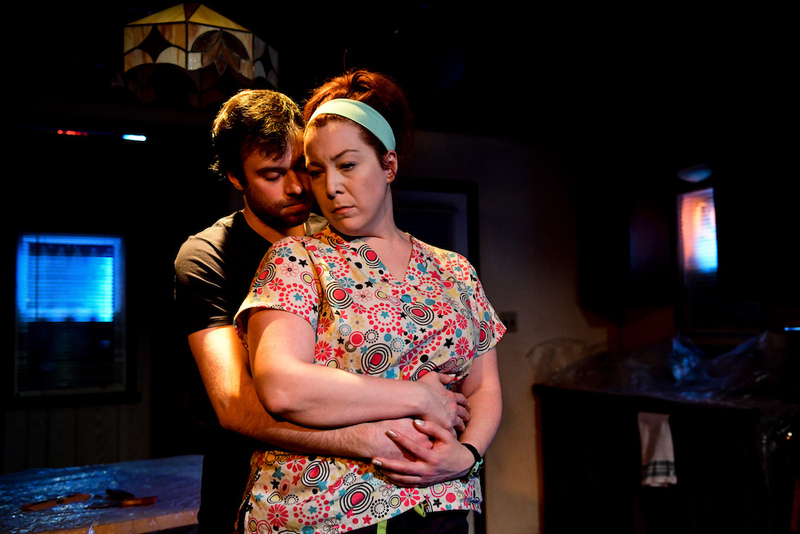 Estranged at the play’s onset, Chris convinces a reluctant and weary Amber to give their relationship another shot, but it’s as damaged as their unlivable, waterlogged house. He promises to be faithful after having an affair with a local waitress. She agrees, they move back in together, and the dysfunctional cycle begins once again. Schwend masterfully ratchets up the tension. Even small indiscretions feel like disasters when people are pulled this tight and stretched this thin. Just a bump in the road is like getting t-boned by a semi over and over, such as when Amber tries to plan a “real nice” party for her eldest daughter. She’s saved to buy her a new bike and orders the good sheet cake from Walmart, but the details start to crumble, and her mom (Barbara Figgins) is there to criticize her at every turn. Barnard’s subtle and strong performance does most of Utility’s heavy lifting. She infuses Amber with a mix of weariness, work ethic, and hope, embodying the complexities of Amber’s struggle to try to be who she once was: a young woman with hopes for a better life. Utility is a fitting choice to end Interrobang Theatre Project’s season, whose theme was identity/crisis. 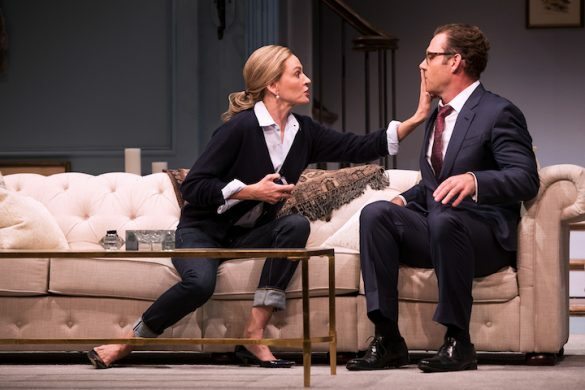 The play speaks strongly of the world we’re living in, the loss of the middle class, and the terrible choices that must be made by families all over the country and in our own backyards. Food or lights? School supplies or gas for the car? They are questions many families face on a daily basis. Families that are often held together by women left with all of the responsibility and none of the opportunities. Utility offers an emotional jolt and an unflinching look at the daily struggles plaguing our country. But when the house lights come up, how many of us are willing to recognize these stories in our own neighborhoods and work toward solutions in the real world? Beth Dugan is a Chicago-based writer, editor, theater critic, and communications expert. She has been writing about Chicago theater for almost a decade. A member of Drinkers with Writing Problems, she also performs her work live on stage.